*Spayed or Neutered prior to puppy being released. *Avid Micro Chip with application. *Current vaccination (NeoPar) and worming. *2 year genetic health warranty (this warranty covers any inherited life threatening disease). *A collar, leash, and puppy food. We recommend a high quality puppy food. *Information on how to care for your puppy, potty training, grooming, etc. *A lifetime of support regarding your Australian Labradoodle. All puppies released at 10 -11 weeks. If puppies are held longer for extra training, additional charge will be administered. Individual quotes will apply according to training request. A minimum of $300.00 down payment is recommended to reserve a puppy. 2nd Step: A contract will be E mailed for your review. 3rd Step: Please inform us that you would like to reserve a puppy. 4th Step: We will supply mailing address for deposit. A $300.00 deposit is what reserves a puppy. 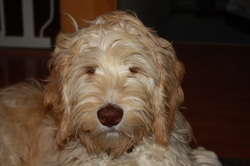 5th Step: View puppy pictures on website: www.auslabradoodle.com Temperament tested best done by 7-8 weeks old. training to each and every puppy. Priceless! 7th Step: Puppy may be picked up or flown from Ontario, Ca. or Los Angeles, LAX Airport. 8th Step: Full payment received the day of pick up; Cashier check or cash. If puppy fly's payment must be received prior to flight. We have never had a puppy returned. However, we understand that unexpected life tragedies may occur. We are here to assist you in anyway in finding a new home for your loving Austrailian Labradoodle. * Transportation cost to Los Angeles Airport must cover gas and driver. If we pick the day, free transportation to LAX. * Free transportation to Ontario Airport.